Triple action in reducing fat! Conjugated linoleic acid (CLA), which inhibits a lipase responsible for storing fat in fat cells (FAT is re-routed to the muscle cells) and stimulates the enzyme palmitol transferase that burns fat. Green tea, which increases fat burning in 17%. Carnitine, which acts by forwarding the fat from the bloodstream to the mitochondria of the muscle cells, where it is converted into energy. Triple action in fat reduction! This unique combination helps to reduce body fat while increasing muscle mass. 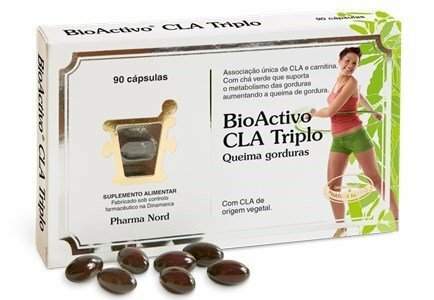 The Bioactive Triple CLA contains the same amount of CLA and Bioactive green tea CLA Xtra, plus 50 mg of carnitine per capsule, for greater effectiveness. Burn 3 times more fat! 3 capsules, 2 times per day, swallowed whole, at mealtimes, accompanied by a glass of water. With the practice of regular physical exercise and a careful diet, the dose may be reduced to 2 capsules, 2 times per day.